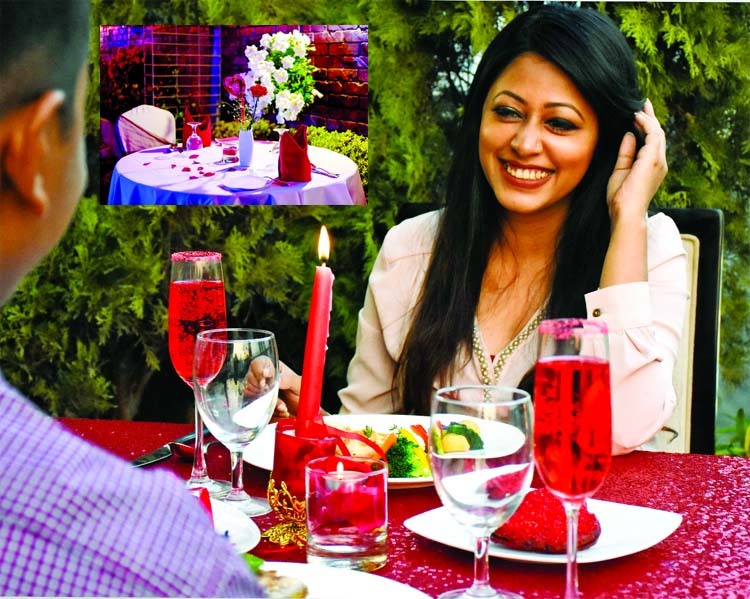 haka Regency Hotel & Resort has arranged a host of events and promotions to keep its guests plenty engaged this year on Valentine’s Day. Celebration in the hotel's all day dining eatery Grandiose Restaurant will begin on February 14 with an extensive buffet lunch (12:30-15:30) at Tk 3,490 per person only and will continue through even a grander buffet dinner (18:30-22:30) at Tk 3,990 per person only. The meals will be accompanied with live music and complimentary welcome shooter mock-tails. Moreover, diners may enjoy Buy One Get One Free on buffet meals with select bank cards, says a press release. The even grander scale event will, however, be hosted at the hotel’s signature rooftop garden restaurant Grill on the Skyline on Valentine’s evening (19:00-23:00). Dubbed as ‘Rooftop Rendezvous,’ the hotel has arranged for an exclusive dinner musicale, which is sure to set the bar for romantic celebration higher for city love birds. The party package includes buffet dinner featuring a variety of grill favorites of the popular restaurant, romantic ballads and duet performances, personalized table-side violin serenades, complimentary welcome cocktail or mock-tail as per diner preference, on-the-table chocolates, instant photo with frame, attractive prizes, and more. Couple Tickets are already on sale at Tk 10,000 per ticket with the promise of knocking 20 per cent off on ticket price for purchases made before February 7. Members of Dhaka Regency Premier Club will enjoy 10 per cent discount throughout ticket sale period. Number of tables are limited so interested guests should contact the hotel soon. Amaya: Presenting authentic and innovative cuisine spanning five continents live kitchens, the hotel invites guests to dine at Amaya Food Gallery for a romance-filled date offering the special Spanish Paella. Along with Guèridon service Amaya is offering a list of delicious add-ons to its vastly diversified buffet station to spur romance. The Japanese, Thai, Chinese, Italian and Indian stations will offer unique specialties for couples to luxuriate their taste buds. The highlight will be the Valentine special Spanish paella. Additionally, there will be an array of other specialties such as whole lambs, chickens, tiger prawns, valentine special dessert arrangements and much more. Price of this special dinner is Tk 5000 per person from 6:30pm till 10:30pm; bogo is also applicable for selected card holders. Cascade: If you're searching for the perfect Valentine’s Day surprise to leave your loved one happily speechless, Cascade Lobby Lounge is offering something distinctive and memorable- a menu crafted from Italian-inspiration expressing profound romance and affection. Cascade Valentine Dinner consists of appetizers, selection of entrées and dolce. To start, there is the aromatic Zuppa Di Fungi soup and selection of Smoked Salmon Carpaccio or Tuna Samoriglio. The sumptuous entrée features a selection of Breast of Chicken stuffed with wild mushroom and spinach with new roasted potato and sautéed vegetable or Pan Seared Bass with herb roasted baby potatoes, sautéed vegetable and sauce vierge. To conclude, the dolce offers the creamiest cream cake and delectable Strawberry Layer Jocund. The Cascade Valentine set dinner is priced at Tk 7,000 per couple and will be available from 7:00pm to 11:00pm. Breeze Spa: For lovebirds who want to celebrate this special ocassion in the great indoors, Amari’s signature Breeze Spa is offering buy 1 get 1 free treatment for a couple From February 14 to 28 on any spa treatment from the menu.